There are certain things people can do to maximize their expected retirement income while protecting themselves from utter destitution. The first step, invest early. A early portfolio means years of compounding and appreciation which resembles the following curve over time given a starting amount of $1.00 over 40 years. This interactive chart displays the progression of $1 through 50 years of compounding at a modest 10% per year, around what the historical average return of the stock market is. As you can see the first few years are unimpressive, but eventually the savings grows past what you would have made investing $1 per year without interest! So instead of spending a dollar every year to save $100 in a non-interest account the one dollar invested in the stock market would equate to twice a yearly non-interest savings contribution. The second point I would like to make is that as you reach retirement age your investments should become more conservative – after all, I am assuming you are using this money to retire on and another point to make is no one lives forever. It is suggested that younger folks should invest most if not all their money in equities while those approaching retirement should go more heavily on bonds, in the 60 to 100% range. If you’ve been lucky enough to save more than enough for retirement, it might be worthwhile to invest in your children or grandchildren’s education – dependant of how magnanimous you are or how well they treated you. Other fine options include starting an expensive hobby such as sword collecting or medieval smithing, surprisingly enough Chrome spell-check doesn’t even know what the word smithing is or how to spell it so there is another great reason to take on that hobby. So today after hours Green Mountain Coffee plunged over 40%, I’m glad that I decided this was not a stock I was interested in holding. Perhaps now is a good buying opportunity? The reports announced that sales were the slowest in five years, largely due to competition in the Keurig compatible K-Cups produced by other brewers such as Starbucks. *Disclaimer – I do not own any GMCR but may purchase shares within the next 48 hours. As investors prepare their taxes for 2011, it is important to keep in mind what a wash sale is and how it effects capital losses. A wash sale is when a security is sold at a loss and the same security or “substantially similar” security is bought back within 30 days. The important key word is “substantially similar”, and unfortunately the IRS is vague on its definition. The IRS has also imposed the wash sale on folks who sell a security and whose spouse or controlled company buys back the same security within 30 days. Will Oil Keep Rising? How can you Protect Yourself? From a macroscopic view yes, a finite resource will eventually disappear from the face of the earth and in that process while mankind is adapting to other fuel sources the price of this resource will increase. In the short term, the price of oil is largely dependent on what unfolds in the Middle East. Libya has been the main reason why oil has been experiencing these recent price spikes, although spikes can hardly be used to describe a price that has not yet receded. If Libya remains in a civil war Saudi Arabia is offering to increase production, although with the way the protests are spreading it is likely that more oil bearing countries will start to ferment unrest at being ruled by tyrants and dictators. I wouldn’t bet too heavily on the oil price receding soon, unless an end in conflict in Libya parallels in increase in production from Saudi Arabia which would be two factors to lower the price. It is better, in my opinion, to be hedging ones bets. If you drive a car and spend lots on oil then you might consider (once the price of oil goes back down) buying oil futures or if you’re feeling adventurous oil ETFs such as UCO. 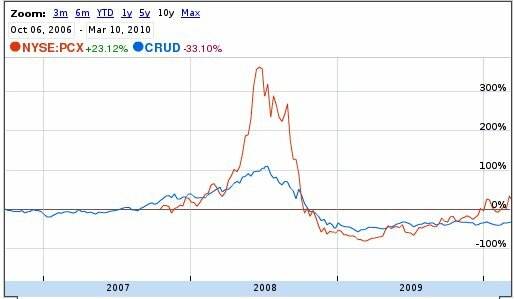 UCO (ProShares Ultra DJ-UBS Crude Oil) aims to reflect twice the percentage increase or decrease of the price of oil. If you are planning on going on a long distance trip in the future that requires oil (either driving or flying) you might consider buying a substantial amount of oil related securities so that if the oil price fly’s you will also be able to. Inflation, more than you have seen in the past ten years, is probably going to be here in less than three years. Why? Put simply, China is beginning to let the Yuan become a free floating currency. This will mean stocks will most likely rise and the value of the dollar will most likely fall. In the long term assets like gold and precious metals will continue to rise, even though currently it is quite likely they are both in a temporary bubble. Ever wonder how to hedge the unavoidable investment you make in oil to get you around every day? Sure, you may consider betting directly on the price of oil through futures trading – one other alternative is to buy stock of a company that refines, extracts, or even explores oil. There is another way to bet for or against oil which I have discovered recently that seems quite on the money – ETFs that aim to deliver a 200% return on a daily performance of an index (in this case an oil future index). Ultra DJ-UBS Crude Oil (NYSE:UCO) will basically return double the daily increase of oil futures while UltraShort DJ-UBS Crude Oil (NYSE:SCO) will return double the daily decrease of oil futures, and before you decide on betting for or against oil see the prospectus for more information on these exchange traded funds. Other options, which may be better suited and more safe for the casual investor, include buying into an energy company such as Exxon Mobil (XOM) or Cheveron (CVX) or simply buying oil futures . A more indirect approach at investing in energy prices is to buy other energy resource companies such as Patriot Coal (NYSE:PCX) which roughly follow (and in the case shown below outperform) the price of oil (See chart below).